“Sining Ugnayan: Creating the NCR Visual Artists’ Directory” is a project that will identify, locate, and record in writing and document in photographs the existing visual artists and artists’ groups all over Metro Manila. There are 16 cities and 1 municipality that make up the geographical basis for the project’s methodology. National Capital Region (NCR) or Metro Manila is composed of 16 cities and 1 municipality (the cities of Manila, Quezon City, Pasay, Caloocan, Malabon, Mandaluyong, Marikina, Paranaque, Valenzuela, Makati, Pasig, Muntinlupa, Taguig, San Juan, Navotas and Las Piñas and The Municipality of Pateros). 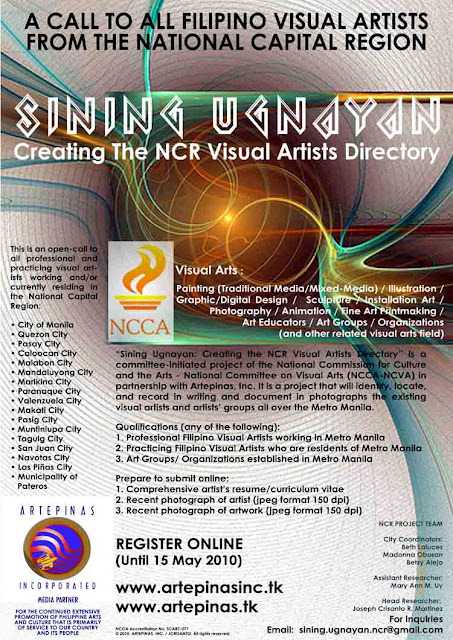 Register online: Sining Ugnayan (NCR) database. Registration is extended till 31 May 2010.